My absolute humble apologies for SUCH a late post! Would you belive that I have actually had this card done for weeks?????? I have no other excuse than it being rather busy week and it just slipped right through the cracks, even though I was totally ready, AND reminded aswell. I am so sorry, and I sincerely hope that you think my little contribution to the 2nd in the international inkers series was worth a tiny wait. So without further hesitation, here is this editions kit! 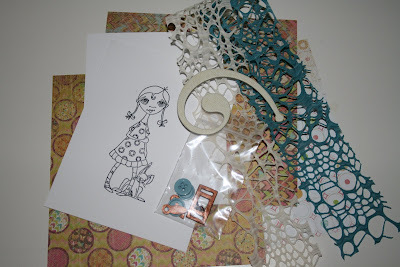 Hailing from the USA, Catherine has supplied us with an adorable kit. So adorable in fact, that I literally ripped the package open & whipped up my card the very next day. - K & Company Urban Rhapsody pattern papers. Here is the finished card. I decided get some good square footage from the papers and such, so I opted for a 5 1/2 x 5 1/2" square, and the easel card fold. The papers were so fun to work with, as everything went together so well. The embellishments were altered so perfectly!! In order to match the embellishments, I decided to do a little altering myself. I used the chipboard swirl and broke out my very neglected Copper Metallic ink pad and went to town covering the entire piece. I immediately sprinkled clear embossing powder over top and set it with my heat tool It looks fantastic and very similar to metal. Thank you so much for stopping by, and I'm sure you have already been.. but if you haven't... make sure you visit the other inkers! Karen this was totally worth the wait! 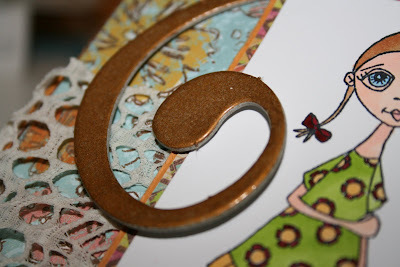 It's such a neat and fun card - I love that you painted the swirlly gig. Hugs sweetie - miss you tons! wow!!! 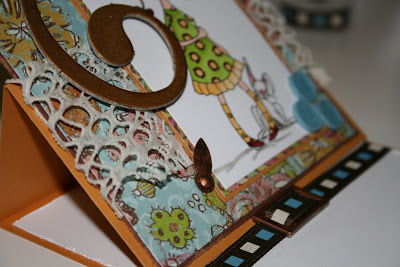 gorgeous card.. That little girl is looking beautiful.that lace and card designs are great. Thanks for this great blog. Oh I love love love it! The ribbon and buckle are the best idea ever for a easel card. Fabulous! I love your total layout and your colors. Awesome! LOL at your having the card done and not getting it posted. That happens to me ALL the time! OOH! OOH! OOH! What a FABULOUS card!!!! 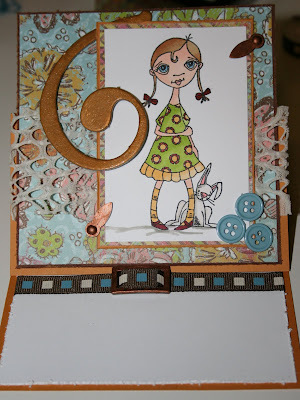 I love the wonderful layout and the way you incorporated all the fabby elements...especially the ribbon treatment:) Such a FUN creation!!! I LOVE IT!!! Great job Karen....love how you pulled this card together...so many wonderful things to look at from the card design to the embellies...great job coloring as well...WELL DONE!!! !